Gold Box Games. Itâ€™s hard to exaggerate the kind of nostalgic reverie that these words are able to evoke in true fans of SSIâ€™s legendary computer role-playing games (CRPGs). Incredibly, itâ€™s been 18 years since SSI released the ground-breaking Pool of Radiance (PoR) in 1988, but contemporary CPRG makers are still trying to live up to the standards it set. What I want to do here is take you on a brief tour of the SSIâ€™s legendary Gold Box line, starting off with the classic and best-known Gold Box games, which are set in the Forgotten Realms AD&D universe. From there weâ€™ll take a glance at the Dragonlance games and, lastly, the Savage Frontier series. Along the way, Iâ€™ll try to offer as much commentary as I can from my own experiences playing these games, both as a youth and as an adult. Hopefully, what will emerge is some understanding of what made these games so wonderful, and why itâ€™s still a challenge even nearly two decades later even to match their appeal, much less exceed them. Meanwhile, Sir-Tech Software had released Wizardry: Proving Grounds of the Mad Overlord. Wizardry continued in Akalabethâ€™s footsteps by revisiting and improving on the first-person dungeon crawl. One major addition was allowing players to control whole parties of their own adventurers rather than focusing all the attention on a single warrior. Also, the screen was now divided into sections, with a picture of the dungeon or a close-up of a monster in the top left corner, and various statistics and information presented in other boxes on the screen. This windowed interface would show up again and again in CPRGs of the era, such as The Bardâ€™s Tale, released in 1985 by Interplay Productions (and published by Electronic Arts). The Bardâ€™s Tale featured better graphics than its predecessors, a large town for a setting (Skara Brae), six character classes, spells, weapons, monsters, and dungeons. The Bardâ€™s Tale seemed to represent a new pinnacle, and itâ€™s very easy to find diehard fans of the game even today. CRPGs were beginning to seem less like dumbed-down conversions of AD&D and more like what we might call â€œturn-based strategy gamesâ€ today, and the stories and environments were becoming ever more comprehensive and elaborate. Really, by 1985, almost all of the conventions of the genre had been forged, and it seemed like advancement would only occur incrementally afterwards (i.e., better graphics, bigger worlds, and so on). 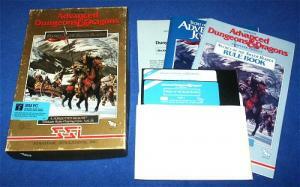 However, all of these aforementioned games had one thing in commonâ€”they werenâ€™t licensed by TSR, owners of the legendary AD&D franchise. TSR seemed hesitant to join the fray, but finally selected a company named SSI to develop an officially-licensed franchise of AD&D CRPGs. SSI, which stands for Strategic Simulations Inc., was better known for making computer war games (what we might call â€œstrategy gamesâ€ today). Though itâ€™s interesting to consider what would have happened if some of the other bidders had won the licenseâ€”such as Electronic Arts, distributors of Bardâ€™s Taleâ€”SSI proved to be quite capable of not only adapting the AD&D content to the computer, but also raising the bar on the whole CRPG genre. SSI released Pool of Radiance in 1988, where it sat on shelves next to competition like Wizardry V: Heart of the Maelstrom, Bardâ€™s Tale III: Thief of Fate, and Ultima V: Warriors of Destiny. Needless to say, the CRPG market wasnâ€™t exactly faltering. Nevertheless, SSIâ€™s key advantage of being able to marshal the considerable might and clout of AD&Dâ€™s horde of licensed content, combined with their own expertise at developing strategy war games, proved decisive. I think itâ€™s important to bear in mind the impressive competition SSI faced in developing its Gold Box Seriesâ€”if PoR had been anything short of fantastic, it wouldâ€™ve been swallowed up, probably along with SSIâ€™s license. So, what exactly did Pool of Radiance offer other than TSRâ€™s clout? After all, the game mostly borrowed or adapted techniques developed in older games, such as the windowed look of Wizardry and the colorful town of Bardâ€™s Tale. Combat in PoR: Note the highly stylized images of the characters. Your characters will miss a lot. Just hope the monsters do as well.One of the most interesting of SSIâ€™s innovations concerned combat. When the playerâ€™s party battles foes, the perspective changes from first-person to third. All pretense of â€œrole-playingâ€ disappears. Players can now see their characters and must move them along, like pieces on a game board. This aspect seems strongly reminiscent of popular â€œwar gamesâ€ at the time, many of which required miniature soldiers and equipment. It also made the battles seem more dramatic by (all too often) watching their beloved characters hacked to death by vicious monsters that were physically much larger and a great deal more fierce-looking. During combat, the player became much less of a â€œrole-playerâ€ and more of a general, rapidly devising tactics and plotting each â€œturn,â€ or â€œround,â€ with careful calculation. Magic-users became the artillery, hiding behind the fighters and launching powerful mass-effect spells like fireballs from behind the lines. Clerics were the support troops, healing injured warriors and blessing them to keep up morale. Fighters performed the obvious function of battling back the horde. And rogues? Well, they slinked in the background, seldom of much use in the fray. Probably the closest equivalent is army engineers, who help an army overcome obstacles and negotiate dangerous terrain. Most players probably multi-classed their rogues like I did, sacrificing a bit of a warriorâ€™s prowess for some skill in picking locks. Another aspect of PoR that sets it apart from much of the competition is its lack of dungeons. Much of the action takes place above ground or inside buildings, which range from the â€œslums,â€ a dangerous frontier roaming with monsters, to a deadly pyramid inhabited by a wizard. Also, at some parts of the game the screen switches to a â€œwilderness cam,â€ particularly when the party is traveling great distances. The player advances in the game both by attacking monsters and fulfilling missions assigned to it by a commission. The missions, or sub-quests, are varied, and as the party fulfils them, they gain prominence in the town. I mentioned earlier that The Bardâ€™s Tale was set in a monster-infested town called Skara Brae. Pool of Radiance follows a similar structure. The adventure begins in a town called â€œNew Phlan,â€ a settlement being reclaimed after being taken over by various forces of evil. Of course, the party will eventually get to explore the ruins of â€œOld Phlan,â€ discovering all kinds of treasures and secrets of this once-powerful city. Itâ€™s really a massive adventure. Iâ€™ll never forget opening the box and discovering four, double-sided disks and two thick booklets; an extensive set of instructions and a â€œjournal.â€ This was definitely not a game for someone suffering from ADD. Curse of the Azure Bonds: Curse had a somewhat more traditional narrative structure than Pool.Pool of Radiance is, at least in my opinion, the best of the Gold Box Games. This could be simply because it was the first I played, but Iâ€™ve met several like-minded gamers of the era. Nevertheless, I enjoyed SSIâ€™s follow-ups to PoR, such as Curse of the Azure Bonds Secret of the Silver Blades, and Pools of Darkness, each released a year after the other. Perhaps the weakest game in the series is Secret of the Silver Blades, which seems much more like a typical dungeon crawl than its predecessors; the emphasis on hackâ€™n slash might appeal to some players, but I much prefer the more story and exploration-focused earlier games. SSI also released three games set in the famous Dragonlance universe: Champions of Krynn, Death Knights of Krynn, and The Dark Queen of Krynn. These games were released from 1990-1992. These games had an instant appeal among fantasy enthusiasts familiar with the popular Dragonlance novels by Margaret Weiss and Tracy Hickman. The Dragonlance games tried to incorporate as much of those novels as possibleâ€”though stopping short of actually having the player use the same characters (Raistlin, Tanis, Tasslehoff, and so on). Instead, the party would encounter characters from the novel in various situations. The results were, in my opinion, somewhat disappointing. Again, the Gold Box games always walked a line between letting the player create his own drama and foisting it upon him. The Dragonlance games tend to borrow a bit too heavily and awkwardly from the novels and thus arenâ€™t quite as much fun as the Forgotten Realms series. Now that the popularity of the novels has diminished (at least, as far as I donâ€™t see any teenagers reading them anymore! ), these games seem destined to be forgotten. Amazingly, at the same time as all these other games were being released, SSI was also developing two games based on Buck Rogers: Countdown to Doomsday and Matrix Cubed. Unfortunately, Iâ€™m unfamiliar with these games, so I can only pass along the obviousâ€”they are set in a science fiction universe rather than the familiar, Tolkein-inspired worlds of fantasy. Iâ€™m also uncertain how well these games fared in the market, but it seems pretty clear that they did not achieve the legendary status of Pool of Radiance. Finally, as if SSIâ€™s CRPG engine wasnâ€™t being adequately tapped, three other games showed up in the same period: Gateway to the Savage Frontier, Treasures of the Savage Frontier, and Neverwinter Nights, the first graphical MMOPRG and featured on AOL. The Savage Frontier games are perhaps most noteworthy today because of their setting in the popular Neverwinter Nights world of the Forgotten Realms. Gateway and Treasures of the Savage Frontier were outsourced by SSI to a company named Stormfront Studios. The key innovation here seems to be a refinement of â€œwilderness play,â€ a perspective device that made the game world seem much larger. Readers hoping to learn more about the Neverwinter Nights game of this period would do better to read the Wikipedia entry, since I, alas, have never played it. Unfortunately, thereâ€™s also another so-called â€œsequelâ€ to Pool of Radiance. That cull is called Pool of Radiance: Ruins of Myth Drannor, a true, ripping travesty of a game. Pleaseâ€”donâ€™t get that game confused with the original Gold Box series; it has little to nothing in common with the classic. As you can tell, thereâ€™s an extensive Gold Box universe here to explore. Rather than gloss through each of the games, though (you can easily do that yourself on Wikipedia! ), I think itâ€™d be more interesting to look at some of the key issues surrounding the series. One of the most common topics that CPRG fans like to explore is whether itâ€™s better for a game to limit players to a single character or allow them to create and play an entire party of adventurers. The issue has obviously been left undecided by the industry, which seems just as likely to release a solo-character game (Baldurâ€™s Gate, Neverwinter Nights) as a party-based game (Icewind Dale, Temple of Elemental Evil). There are clearly advantages and disadvantages to each approach, but I think the main emphasis in this discussion ought to be about role-playing versus strategy. A party-based game is first and foremost about strategy. Although the Gold Box games feature rich stories and playing environments, they seldom try to force a linear structure on the player. True; there is a meta-quest and scores of related and unrelated mini-quests that build up to it, but much of the drama and â€œrole-playingâ€ is left up to the player. For instance, the characters arenâ€™t shown to interact with each other. They donâ€™t have canned dialogue like so many modern games. Does this mean that they â€œhave no character?â€ Of course not! What happens is that players will quickly create and assign personalities to their characters, and imagine them in a variety of dramatic situations that donâ€™t actually occur on the screen. For instance, perhaps a fighter is in a romantic relationship with a cleric or rogue. Likewise, players can yell out battle cries for their characters and egg them on like spectators at a sporting event. Only dull, unimaginative players just sit there, focused on numbers and stats. Also, the Gold Box games let players choose â€œalignmentsâ€ for their characters, which range from Lawful Good to Chaotic Evil. Obviously, not all combinations will work together, and in some cases players will experience different interactions with non-player characters if their party is of a different alignment. Mostly, though, the alignment issue serves as more fodder for the imagined drama and scenarios going on in the playerâ€™s imagination. Itâ€™s fun to imagine, for instance, how a â€œlawful neutralâ€ character and a â€œchaotic goodâ€ character would respond to a given ethical dilemma, such as killing a fortuneteller. What actually happens on the screen during a party-based game is mostly strategic. Just creating a party of six adventurers can be a daunting task for the novice. There are dozens of decisions to make, some of which have major repercussions. Dedicated players will have to learn all kinds of terms like â€œdexterityâ€ and â€œTHAC0â€ and how all these numbers and percentages affect their success in combat. As I mentioned earlier, veteran players act mostly as generals, marshalling their magical resources before (buffing spells), during (attack), and after (healing) a major confrontation. The magic system is fairly involved, and requires that magic-users â€œmemorizeâ€ a spell before they can cast it, which requires rest and relaxation. Thus, players will have to be frugal, only using magic when it is necessary. Secret of the Silver Blades: Unfortunately, the word "yawn" pretty much sums it up.Games like PoR seem almost insanely difficult when compared to so many modern games, which make every effort to baby-step novices through the game. As I mentioned earlier, PoR came with an extensive manual, which players would almost certainly have to familiarize themselves with very carefully. It all seemed frightfully realistic. Items had weight, for instance, and even finding too many coins could encumber a character (there was actually a currency system). Characters who were knocked unconscious during combat must be â€œbandagedâ€ before the battle endedâ€”or they might die. Monsters might show up while the party was encamped, spelling certain doom for adventurers still recovering from a terrible battle. Solo-character games, in contrast, are often focused much more on the story and linear development of a character than party-based games. For instance, in Baldurâ€™s Gate or Neverwinter Nights, the player can (and itâ€™s probably safe to say â€œmustâ€) hire a non-player character called a â€œhenchmanâ€ to accompany her. These henchmen come equipped with their own store of dialogue and set interactions with the character; in short, itâ€™s an effort to â€œdo the workâ€ so the player wonâ€™t have to imagine all of the interaction herself. Furthermore, combat shifts from a focus on strategy to a more action-based mode. Combat decisions are reduced to a minimum. The benefit here is that combat tends to go by much faster (often in â€œreal-timeâ€ as opposed to turn-based), and gets players back into the story much sooner. Indeed, one of the chief complaints heard about The Temple of Elemental Evil, released by Atari in 2003, was that the battles took too long. It was â€œjust too difficultâ€ for the modern gamer. Most gamers by that time had been conditioned by Blizzardâ€™s 1993 release, Diablo, to a very humble click-and-point combat system and easily-grasped rule system. These â€œinstant gratificationâ€ CRPGs have only recently waned, replaced perhaps by the ubiquitous MMORPG. Another advantage of the solo-player game is that they generally have greater replay-value. A player beating the game as a fighter might want to see what the experience would be like as a mage, and so on. Another topic of debate oft heard among Gold Box gamers is that of transferring versus creating new characters in the sequels. Again, this is an issue with no easy solution. It was possible, for instance, for a player who had finished Pool of Radiance to move his vastly experienced and powerfully equipped characters into Curse of the Azure Bonds. The only problem was that they might be so formidable that the game would become virtually a walk-through, with the monsters posing as little more than annoyances rather than fearsome encounters. SSI tried to alleviate this problem in the third game, Secret of the Silver Blades, by not allowing a transferred party to keep any of its equipment from previous games. The end result was clearly an example of over-compensating; now, even experienced players were left so vulnerable that the initial stages of the game were almost impossible. The advantage to transferring characters is clearâ€”players may be attached to them and donâ€™t relish the idea of having to dredge up new ones for each new game. Creating a party can be a lot of work, and it may prove discouraging to have to start each game with extremely vulnerable, inexperienced characters. Nevertheless, the problem of achieving balance seems too great for most such â€œtransfersâ€ to be successful. In any event, itâ€™s probably better for Gold Box Gamers to create fresh adventurers each time. Interestingly enough, this same problem cropped up much later in Bioware's Neverwinter Nights expansions, Shadows of Undrentide and Hordes of the Underdark. In both cases, it's probably less of a headache just to create new characters than muck about with old ones, particularly since the expansions offer special classes. Most curiously, in Hordes of the Underdark, Bioware tried a similar approach to SSI's Secret of the Silver Blades. The player can transfer a character from another compaign, but doesn't get to keep the equipment. However, this time the player can get it back, albeit by the time that's possible it's probably not worth the effort anyway, the player having gotten superior gear in the meantime. Folks, I could go on and on about this topic. Itâ€™s easy to write about the Gold Box Games because they are great games, and thereâ€™s a heck of a lot to talk about. Still, at the end of it Iâ€™d have to say that the games did less to innovate the genre than they did to refine it. They took mostly existing models and improved them. Most obviously, they revolutionized the combat system, driving it into what weâ€™d call â€œturn-based strategyâ€ today. Diablo: Modern CPRG fans with their "lightning clicks" wouldn't last five minutes with a Gold Box Game.Also, though it might strike modern readers as something of a nonsense statement, the â€œlimitedâ€ state of computer technology at the time actually had a positive effect on these games. There was definitely something lost in the late 90s, when games like Baldurâ€™s Gate began incorporating more realistic graphics, sounds, dialogue, and speech clips. Although this realism might have been impressive for the eyes, it was somewhat stifling for the imagination. The â€œprimitiveâ€ graphics of the Gold Box Games were highly stylized, and that meant that players could inject a great deal of imagination into the way they looked and acted. Modern CRPGs, by contrast, try do as much of this imaginative work as possible for the player, often reducing her to little more than someone who sits and listens, occasionally clicking a mouse. As for me, I cringe when I hear my character in Neverwinter Nights repeating the same speech clip Iâ€™ve already heard a thousand times. Also, even though the graphics have undoubtedly improved, I canâ€™t say that theyâ€™ve really helped me immerse myself into these games. Although the more realistic backgrounds and structures are certainly welcome, the characters seem caught in that quandary between â€œrealisticâ€ and â€œfake looking.â€ Sure, you can see them swinging their swords, but the limitations require that we see pretty much the same few animations over and over again, until they lose their potency. Clearly, this is something that will improve with time, and itâ€™ll be interesting to see what Neverwinter Nights 2 is able to accomplish in this regard. In short, the Gold Box Games taught us several lessons about what a great CPRG is all about. First and foremost, they are about imagination. The CPRG should bring out the imagination in all of us, not try to reduce it by substitution. Secondly, a great deal of the fun takes place on the micro-management level. Creating a whole party of adventures and duly equipping them, to say nothing of strategically controlling them in battle, requires a huge amount of micromanagement. The difference between the micromanagement in the Gold Box Games versus the far more recent Temple of Elemental Evil isnâ€™t one of kind, but rather of degree. Micromanagement in the Gold Box Games was fun. Temple made it tedious. TSR made the right decision when they selected a strategy-game company to make PoR. I only wish that the great strategy-game makers of our era, most notably Sid Meier, would perform that role today. As for MMORPGs, I see in them really more of a fad than a lasting genre. Surely, once the â€œnewâ€ wears off, and mainstream gamers have some new fad to chase, theyâ€™ll suffer the same fate as their textual MUD ancestors. No, what we need is another series of CRPGs willing to take players into those Forgotten Realms once againâ€”SSI style. EDIT: If you're interested in trying these games for yourself, you can't do much worse than this box set from Amazon. There are only a few left, so hurry! I'd just like to point out that TSR published their OWN computer games in the very early 1980's for the Apple II series of computers. They translated "Dungeon!" and a few other, original titles. I believe many were basic randomized dungeon crawls. I've only seen the games mentioned once as a child in the pages of the legendary Electronic Games magazine (along with a single hi-res screenshot/artist rendering) and a few years back available on eBay (which I sadly failed to procure). I've never seen them before or since, but they absolutely do exist. They were roundly considered primitive and noncompetitive with even other games of the time for the most part (one or two may have been passable). It's no wonder TSR - beyond licensing their main property to Mattel for the successful Intellivision and Aquarius games - waited for SSI to go full bore back into computer gaming (the Mattel Aquarius computer game was just a variation of one of the ones available on the Intellivision). By then SSI and their stable of go-to talent had the RPG down to a science and it was an obvious success for both companies. I played Neverwinter Nights on AOL when the game was on its last legs and being phased out in one of AOL's famous revamps. I dabbled in the game since AOL was still expensive back then - no unlimited gaming. It accurately captured everything about the Gold Box games - hell, it was an exact clone of the early Gold Box engines (it didn't incorporate the higher-res graphics and digital sound of the last games in the series) - but it had a very deliberate pacing and was rife with early online graphical gaming problems. Frankly, if the time limit and dollar limitations weren't there for me, I would have invested quite a bit more time in it, but, despite being a success for several years, the tech and timing were just not right to have it continue. As for the Buck Rogers games, they were critical successes, though not necessarily anywhere near as commercially successful as the straight fantasy games. I have "Countdown to Doomsday" (Amiga version) and will someday get "Matrix Cubed" (I don't care which version). The former came with a paperback novel of the same name. I do look forward to playing it, as supposedly it's more than a simple engine shoehorning. As always, the cover artwork was a pleasure in and of itself. 1) The turn-based Battle System was very nice because you had to make tactical decisions of where to move your party members, instead of the usual "Fight/Fight/Magic/Item" formula of most fights. Pool of Radiance's fighting engine is a precursor to what we see in "Final Fantasy Tactics" and other similar "Tactics" games. A turn based RPG fight with movement of NPCs takes longer to finish, but are often more rewarding to the player. Of course, all turn-based RPGs' battle systems are based on one of the oldest games of all: Chess. 2) I really like your point about micromanagement. In the older CRPGs and VRPGs, the kinds of weapons you could buy were fairly limited, but it made it feel more special to get an upgrade. To go the Weapons Shop and upgrade from a Dagger to a Broad Sword, for instance, required a lot of work to gain enough gold to buy it. In the older games, you actually got a sense of accomplishment ("Yeah, I finally can afford the Platinum Armor") that you don't get in modern games with 230 different armor types. 3) Modern games are much easier than than older ones, true. Still, I appreciate not having to draw maps by hand anymore! You make some good points, Mat and Bill. The sense of accomplishment was very keenly felt in Pool of Radiance, mostly because common items were so plentiful. In PoR, when you killed an army of kobolds (or whatever), you had stockpiles and stockpiles of armor and simple weapons you could try to pick up and sell in town. However, it was worth so little, that you soon got over it. Magic items were rare indeed. Just finding a longsword +1 was reason to celebrate. What was even better was that most of the best items were carefully hidden in secret rooms and the like. But--and here's something that flies right over the heads of modern CPRG devs--these were bonus items. You didn't need them to finish the game. In games like NWN, it soon becomes obvious that you'll need powerful magic items just to survive. If I were designing a CPRG, I'd make magical items rare and hard-to-find. What ends up happening in a game like NWN is what I call "magic inflation." The level designers are constantly having to provide more and more powerful items. Pretty soon, even plate armor + 5 will seem like junk. I might add that I never cared for the + 5 business anyway. It seems very lame, and too focused on numbers. I prefer items that grant special abilities or incorporate new tactics. One of the lamest items in most CPRGs is the "Ring of Protection." It's always followed by a number. It's obviously just a stat-raiser. Stuff like that really shows a lack of imagination. On a positive note, I think it's neat how in NWN you can specialize very heavily in certain weapons. I think they should've extended that to armor and shields as well. It's pretty obvious to me that a highly experienced warrior would know how to use armor more effectively (in real life, just putting the stuff on required hours of work and an assistant). Of course, the downside to the specialty system is that after you've fully committed and invested in a weapon (I chose a halberd), you suddenly stop finding any magic halberds. You find all kinds of other awesome weapons instead. This is very discouraging. Probably the lamest of the lame in NWN is in Hordes of the Underdark. There's a smith there that will, for a given amount of cash, basically give you enhancements to a weapon. It's a copout, again focusing too much on numbers rather than on anything fun about the weapon. It doesn't even change in appearance when you go from a +3 to a +10. One of the M&M games (can't remember right now which one) actually featured item damage and a repair skill. What it amounted to was that your gear was constantly taking damage, and you had to either fix it yourself or pay to have it fixed. Gear that was heavily damaged wouldn't work very well. In practice, it proved mostly tedious, and if a particularly valuable piece of gear was destroyed--time to reload. While this seemed a bit extreme, I think it makes sense to have stuff slowly wearing out. Again, in games where the items aren't so inflated, it's not that big of a deal to replace a helmet and such. I'm still not sure how I feel about the concept. It's really too bad that more CPRGs can't take the Metroid approach. What I mean is that the items you find there don't just give bigger lasers; they actually change the way you play the game. There are a few instances of that in Hordes. For instance, you can get a grappling hand like thing that can propel you around and scoop up distant treasure--a very cool concept. There's also a few other items that let you change your shape and the like. Mostly, though, the items just raise a few stats here and there. Boring. Any fan of the M&M series will know how fun it is when your wizard finally learns the "fly" spell and the whole party can now fly around the landscapes, visiting all sorts of places they couldn't reach before (and much faster, too). The same goes for the teleport portals. These seem like easy enough things to implement (Morrowind has some of this, too). I guess it must be extremely difficult for CRPG designers to offer enhanced weapons and items that aren't just "+5" style. Oh, here's a helmet that offers 20 fire resistance. Uh, okay. Sure. M&M actually let you enchant your own items that way, so that pretty soon every piece of equipment worn by the party had some kind of enchantment on it. Talk about getting carried away!! Booooo! What's wrong with +5 blah of blahing? Seriously though, I've played both of the Buck Rogers games back on my c128 and they were quite good. The basic style was the same as you'd expect from the other gold box games, though general combat was different given the genre. Range combat became the norm while hand-to-hand took a backseat. Mind you, the hand-to-hand could be very effective, so closing to melee range was often advantageous for the warrior-based classes. Spells (both combative and healing) were gone, so you needed explosive weapons to perform fireball-like damage. You typically had a least one, potentially two, medics that I believe would attempt an autoheal after combat. Healing during combat, I think, was limited to object usage (it's been a while though, so I could be wrong). One of the things I enjoyed about the BR games was that skills played a large part, with things like hacking/programming, communications, medical, and other sundry skills playing a fair part in getting you through the game (something that is virtually non-existent in the other goldbox games). In addition, skills could affect combat, since if you were fighting in a zero-g environment and botched your zero-g skill you'd perform patheticly (very little moment and lots of combat penalties). Ship-to-ship combat was also available (along with necessary skills like piloting and juryrigging), and often left you with the choice to obliterate the opponent, board, or flee. Btw, finding a +1 sword in Pool of Radiance wasn't special. I just recruited hirelings, let them get killed, then took their stuff... all will Lawful Good! :) Also, I'm pretty sure your equipment was swiped from you when you went from Pool to Curse. Of course, I may be getting this confused since I often would put my characters through the Whitebox "Keep" game (can't remember the full name). As for Secret of the Silver Blades, I never found it too difficult to play early on, as the town gave you rudimentary equipment. Of course, all the enlarge spells proved extremely effective in insuring maximum damage potential, which certainly helped. Heh, you raise some really good points, Kryllith. Actually, I was thinking about you when I mentioned the BR games, since I remember your playing them quite a bit (along with a post-apocalypse game I can't remember). Your description definitely makes me want to give them a spin. You're right, non-combat skills never played much role in the other gold box games. I don't even recall related skills like haggling and the like. I still think Fall Out had the most interesting skill system. I knew about the hireling thing, but I never felt right about doing it. Seems like there was a hero who'd join the party for 1/3 the gold who had a magic broadsword (or maybe a two-handed sword?) At any rate, I never liked hirelings and still resist it even today, preferring to go it alone rather than buddy up with a "henchman" in NWN. To my mind, the only game that ever did the henchmen thing right was Chrono Trigger. What I find most lame about the items is that they really don't do anything but raise a stat or two. I think a magic item ought to do more. Hordes of the Underdark had some interesting items--there was a claw that worked a bit like the gravity gun in Half-Life 2, and a ring that'd let you see hidden chests and doorways. Both very neat. I really like it when an item gives you a new ability rather than just raising a stat. I wasn't much for the hirelings myself; I just used them to get a quick boost equipment wise. I believe you could get a +1 short sword off the level 3 thief, a +1 broadsword from the hero, and rings of protection from the level 4 mage (might have gotten something from the level 3 cleric too, but I can't remember). Cheesy, I know, but then so is getting stuck with huge amounts of kobolds or running into the group of ogres and trolls early on in the game. Btw, the post-apoc game I was always playing was Fallout. It's predecessor (Wasteland) also had a nice set if skills. I know what you mean about equipment doing more than just the simple +hit/dam though. I don't recall much in the first game other than that. Unfortunately they didn't make use of intelligent weapons, or even weapons with alternate powers (a Rod of Lordly Might could have been interesting). Granted their boundaries were probably a bit tighter back then so far as what they could do.